This sauce will make you take off and fly away on a magic carpet. You hear the music play down at the Jemaa el-Fna in Marrakech and you just fly, fly away. Once you have tasted this sauce, I’m sure you will be as solid for the way I am. 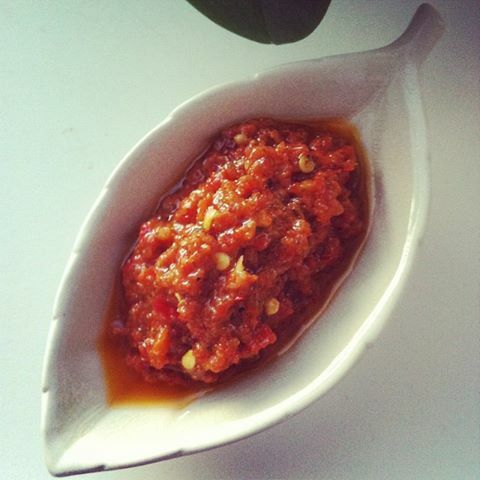 There is probably nothing that beats this strong, hot and flavorful sauce. 🙂 The strength depends on the type of chilis you use. And you know what? You get used to, even if you do not like spicy seasoned. The spices in the sauce is perfectly balanced, like everything else in Moroccan food. Put everything in a blender and blend it until smooth. Ready to use. Keeps well in the refrigerator. I want to try this but am not sure what kind of red chilies to buy. Are there different types? Thanks! This looks soooo good. I want to try this but we dont have pickled lemon here where i live. and what do you mean dried coriander? is it the dried coriander leaves?